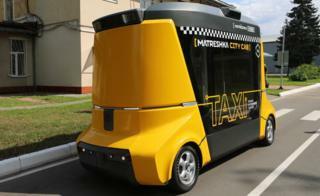 Image caption Driverless taxis - the transport of the future? A growing number of tech analysts are predicting that in less than 20 years we'll all have stopped owning cars, and, what's more, the internal combustion engine will have been consigned to the dustbin of history. And if you're thinking this timescale is wildly optimistic, just recall how rapidly cars replaced horses. First off, consider how Uber and other networked taxi companies have already changed the way we move around. In most major cities an Uber driver - or one of its rivals - is usually just a couple of minutes away, and charges less than established taxis, let's say £10. The company's exponential growth is evidence of how powerful the Uber business model is. Now take out the driver. You've probably cut costs by at least 50%. So if we're trying to work out when this revolution will begin in earnest the key date will be when self-driving vehicle technology is available and - crucially - has regulatory backing. These factors aren't that important for most consumers - after all, the average driver in England does less than 10,000 miles a year and our cars are parked 95% of the time. However, they are huge issues if you're using a vehicle pretty much continuously, as would be the case with a self-driving taxi. Image caption The end of the road for the internal combustion engine? Add in the low cost of recharging batteries compared to refuelling and you've got another dramatic reduction in costs. And it's worth noting that the cost of electric vehicles is likely to continue to fall, and rapidly. As they become mainstream, returns to scale will drive down costs. That's the logic behind Tesla's $5bn (£3.8bn) battery plant, the so-called "Gigafactory". At least that's what tech prophet Tony Seba reckons. He and his team at the think-tank RethinkX have done more than anyone else to think through how this revolution might rip through the personal transportation market. We've now cut our £10 fare to just £1. Mr Seba calls the idea of a robo-taxi network "transport as a service", and estimates it could save the average American as much as $6,000 (£4,560) a year. That's the equivalent of a 10% pay rise. And don't forget, when the revolution comes you won't be behind the wheel so now you'll be working or relaxing as you travel - another big benefit. What's more, once this new model of getting around takes hold the benefits are likely to be reinforcing. The more vehicles in the network, the better the service offered to consumers; the more miles self-driving cars do, the more efficient and safer they'll get; the more electric vehicles manufactured, the cheaper each one will be. Don't worry that rural areas will be left out. A vehicle could be parked in every village waiting for your order to come. And range anxiety - the fear that you might run out of electricity - won't be a problem either. Should the battery run low the network will send a fully charged car to meet you so you can continue your journey. You've probably seen headlines about accidents involving self-driving cars but the truth is they will be far safer than ones driven by you and me - they won't get regulatory approval if they are not. That means tens of thousands of lives - perhaps hundreds of thousands - will be saved as accident rates plummet. According to the tech visionaries it won't be long before the whole market tilts irreversibly away from car ownership and the trusty old internal combustion engine. Image caption Will cars parked outside houses soon be a thing of the past? And, please take note: I haven't mentioned the enormous environmental benefits of converting the world's cars to electricity. That's because the logic of this upheaval isn't driven by new rules on pollution or worries about global warming but by the most powerful incentive in any economy - cold hard cash. That said, there's no question that a wholesale switch away from fossil fuels will slow climate change and massively reduce air pollution. But seriously, I've deliberately put these arguments forcefully to prompt debate and we want to hear what you think.